Most of us, when we think about our credit cards and their online presences, think about the mass ads found on the sides of the pages in search engines. We just automatically assume a credit card’s primary goal for the internet is its strong marketing potential. What you might not know, however, is the many ways the credit card company’s website can benefit you, your monthly budget and ultimately, your credit rating. This week, we explore the Discover website and its many benefits. The universal message? Assume nothing. This is one powerhouse of tips, rewards and other Discover products that work well with your Discover credit card. The home page is not unlike its competitors – plenty of flash – literally, as in “flash players”, along with the obligatory customer reviews. As you scroll down a bit, though, this is where you see the “good stuff”. The Cash Back Bonus page actually brings you to the site’s WordPress blog. The “I heart Casback Bonus” title is followed up with, “For every reward, there’s a story”. This is where Discover consumers retell their own exciting stories of the Discover gift cards, cash back and other features. From there, you’re brought to the Shop Discover page. This is where it gets good. Currently, Discover has partnered with more than 200 well know retail outlets. The cash back bonuses vary from 5% to 20% and there are many ways to familiarize yourself with those 200+ retailers. You can do a product search – think “dvds” or you can browse the current deals – think “TCM dvd sale”. There’s also a page reserved exclusively for travel offers. Some of the many retailers include WalMart, Omaha Steaks, Bloomingdales and Turbo Tax. Also, without clicking from retailer to another, Discover has its participating partners alphabetized on one single page along with the current cash back bonus percentage. While we usually equate “Discover” with credit cards, the website offers information on its many other products, including personal loans. You can even apply online for these loans or a new Discover credit card. Of course, our first priority is always the safety built into the website itself. Discover incorporates the absolute latest in website security. While that’s not necessarily surprising (all credit cards sink much of their budgets into the safety features of their projects), we like the way Discover has its safety built in and quietly running in the background. No busy scripts to slow your experience or freeze your computer (a complaint many consumers often have while shopping online). This feature is rather unique in that it is an option on every Discover website page. It’s an all-inclusive and quite beneficial way to understand those frustrating financial words and lingo. From APR to where to find your Discover card’s CID (card identification number – usually three digits – found on the back of a credit card). It also breaks down your interest charges and interest rates and other financial terms that many consumers rarely pay attention to – though should. Finally, card members can visit the Discover Financial Education Page. Here, you can explore the 2009 CARD Act, learn more about budgeting tips, how to avoid having your identity stolen, savings tips and even download spreadsheets for your monthly budget. It’s written in easy to understand terminology and honestly, it’s quite frank. It’s streamlined, to the point and for those who take advantage of it, it’s a great tool to incorporate. Of course, all of the credit card companies, including Visa, MasterCard and American Express, each have their own user-friendly websites designed to keep their customers in the loop with the ever-changing financial laws and breaking news. 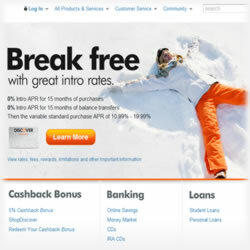 Each also has its own dynamics for education, applying for new credit cards and other helpful tips. They’re just not as often utilized as many might think. It’s a great way, though, for consumers to close the gap between them and their networks. It’s time well spent. Finally, as most folks who follow our blogs know, we always encourage consumers to review the terms and conditions associated with their credit cards and this is the best place to find them, as each company always has the most current versions uploaded to their websites.